It's interesting how in the world of Christianity, there is so much room for "Christian celebrity." Obviously, this is not the world that Jesus imagined, but if you've ever heard the story of the triumphal entry that is often told on "Palm Sunday" you hear about Jesus' entry into Jerusalem days for his death where the people greeted him with palm branches thinking that Jesus was the hero to overthrow the Roman government. 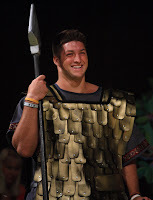 The era of Christian's looking for celebrity within their midst certainly is present in today's Christian church, and one of those Christian celebrities is Tim Tebow, the University of Florida Heisman Trophy winner who has been drafted to the Denver Broncos. 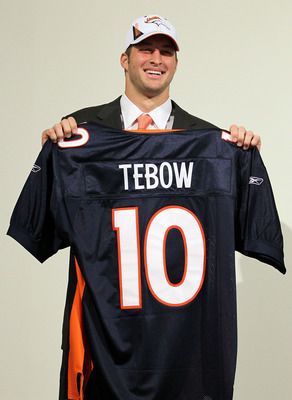 Tim Tebow is known for his faith, which is impressive. 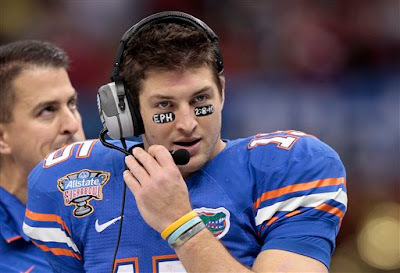 I have no problem with the way that Tebow attempts to live out his beliefs in active way, and I admire the way he uses his ability to build up something he values above his world of football. Yet, the way Christian culture gets overtly excited about "Christian Super Stars" sometimes is, well, just funny. Imagine knowledge that this "Christian Super Star" is coming to Denver, Colorado and instantly some begin saying things like "I'm sure Tebow will want to come to my church." Or "I really hope Tim Tebow gets a chance to meet my single Christian sister, I'm sure they'd be a perfect match." Some might already be figuring out how they can invite Tim to their church, and thinking "of course he will want to come here" because the church is small/big/popular/outreach oriented/Baptist/well-known. 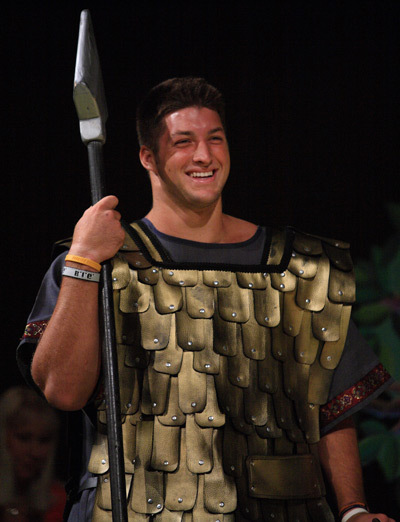 So as Tim Tebow changes jerseys from one shade of blue and orange to another shade of blue and orange, I present you the picture of him and number 10 jersey (although speculation is he will return to his number 15 jersey for the Broncos), as well as a picture of Tebow as Goliath at his Florida home church First Baptist Church of Jacksonville. (picture from Baptist Press article). 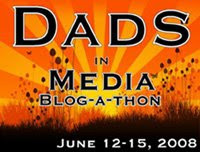 Some Christians might be excited for this celebrity to come to town. Sports fans might wonder what this draft pick really means for a player that people weren't sure if he would be cut out for professional football, not to mention Bronco Quarterbacks Brady Quinn and Kyle Orton might be worried about what this draft means for them as well.